Fantastical, raunchy, and utterly insane. “This is the End” crosses over multiple genres and does so with an infinite supply of humour, sentiment, and flare. While you can expect the downright nasty and over-the-top hilarity that comes when you trap these funny, vaguely immature guys in the same room. You might also want to prepare for an abundance of heart-stopping moments and excessive, albeit comical, gore. With a plethora of high-profile cameos and a seemingly never-ending chain of body-aching laughs, that more often than not stem from stupidity and selfishness. “This is the End” is a brilliant showcase of the top-dogs in comedy and really magnifies the genre’s constant stream of disappointments. Thank heavens these guys can take a joke just as well as they give them. “This is the End” is everything you think it is, and surprisingly, so much more. Jay Baruchel arrives in Los Angeles to spend the weekend with his old friend Seth Rogen. After getting high and hanging out all afternoon together, Seth invites Jay to James Franco’s home for a housewarming party. Afraid that Seth will ditch him at the party, Jay is very distant and unfriendly. Later on in the night, the two walk to a nearby convenience store to buy cigarettes. While rummaging through the candy and beverages, beams of blue light break through the ceiling and carry patrons into the sky. The two rush back to James’s house through the carnage and chaos that awaited them outside. When a series of unsavoury events take place soon after, the party-goers come to the realization that the apocalypse is upon them. After the atrocious entries for “comedy of the summer” such as “The Hangover: Part 3” and “The Internship” universally and predictably failed in all their incessant and unnecessary glory, and with nothing scheduled to blow any serious smoke. “This is the End” as of the moment, is easily in the lead and front-runner to win the title outright. Obviously the restricted rating limits its financial success as it excludes a majority of the immature, loud-mouthed youth, which just so happens to be the target audience. Regardless, “This is the End” should create enough critical and box-office success to be one of the best films of the summer. Besides Guillermo del Toro’s “Pacific Rim,” “This is the End” has the potential to be the sleeper hit of the summer. With its spiritual premise, quirky cliches, and nasty, unrelenting humour. “This is the End” is that rare breed who’s staying-power is truly unlimited. Yes, you may be able to predict a good chunk of the jokes before-hand and of course there is a substantial amount of vulgarity and sexual references, both abusive and consensual. Nonetheless, “This is the End” has a few tricks up its sleeve and part of its unforeseen effectiveness stems from its unpredictable nature. “This is the End” has a story that has been tread and retread time and time again. What makes this go-around unique is unprecedented sappiness and a heartwarming core. Through all the punch-lines down in the muck, surprisingly, there are moments of sheer joy and meaning which truly separates “This is the End” from the pack. Aside from its demented comedic taste and chummy sweetness, “This is the End” offers up a few genuine scares and brilliant CGI work, something no one expected from this buddy-comedy under the influence. Written and directed by Seth Rogen and Evan Goldberg. 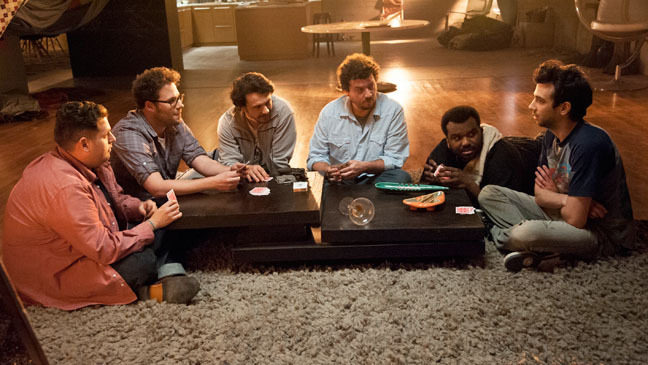 “This is the End” also stars James Franco, Jonah Hill, Danny McBride, Craig Robinson, and Jay Baruchel. Now, there is no question that this group of guys know their way around a joke and how to create an endless supply of quote-worthy dialogue. Still, it is always a nice change-of-pace to see them break out the dramatic chops. Franco, without question is the most accomplished of the cast, yet plays the least grounded and sensible character. McBride and Robinson, easily the most underrated of the group, finally get another chance to showcase their talents. Rogen and Baruchel, the films two leads, form a brilliant duo who need to make amends before the apocalypse takes their lives. As for Jonah Hill, whom I love, I’ll put it this way. He is the one you least want to make it out alive. 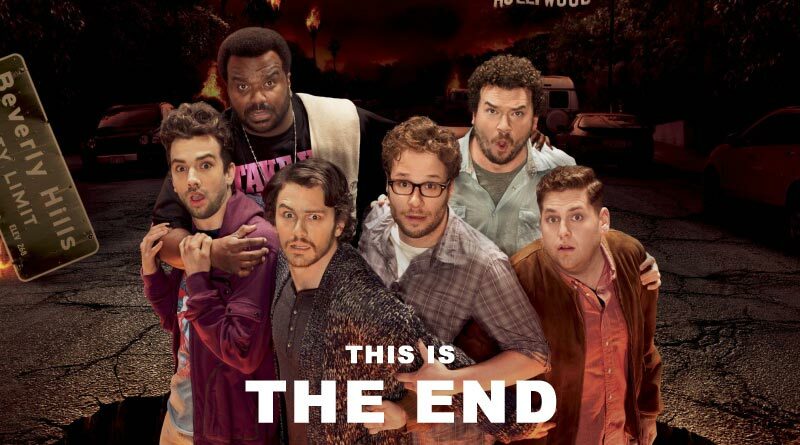 Performed with outstanding charisma and hilarious circumstances, “This is the End” isn’t your typical doomsday flick. This is the End: 8 out of 10. Here is a list of the film’s cameos. let me know if I missed anybody. Jason Segel, Channing Tatum, Rihanna, Michael Cera, Mindy Kaling, Kevin Hart, Christopher Mintz-Plasse, Paul Rudd, Aziz Ansari, Emma Watson.